DAYTONA BEACH, Fla. 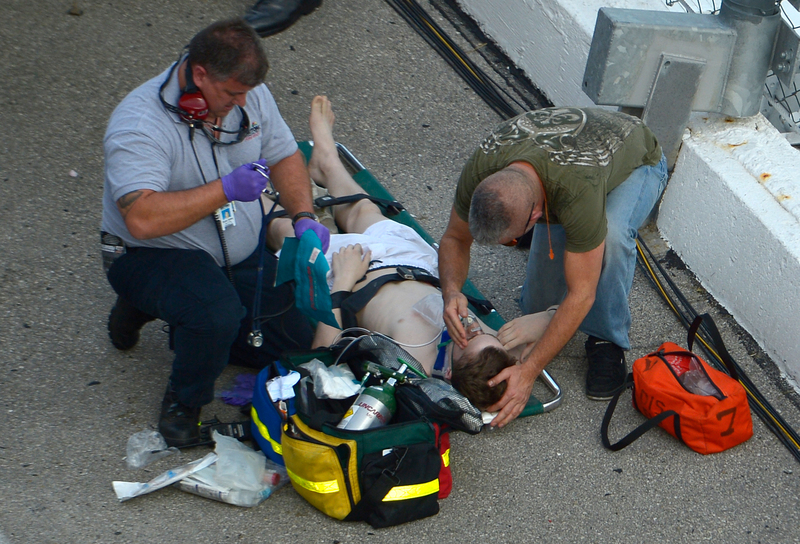 The risks of racing extend beyond the drivers. The victims were sprayed with large chunks of debris  including a tire  after rookie Kyle Larson's machine careened into the fencing that is designed to protect the massive grandstands lining NASCAR's most famous track. "There was absolute shock," Devine said. "People were saying, `I can't believe it, I can't believe it. I've never seen this happen, I've never seen this happen. Did the car through the fence?' It was just shock and awe. Grown men were reaching out and grabbing someone, saying, `Oh my gosh! Oh my gosh!' It was just disbelief, absolute disbelief."  In 1987, Bobby Allison's car lifted off the track at Talladega Superspeedway in Alabama while running over 200 mph, careening into the steel-cable fence and scattering debris into the crowd. That crash led to the use of horsepower-sapping restrictor plates at Talladega and its sister track in Daytona, NASCAR's fastest layouts. As a result, the cars all run nearly the same speed, and the field is typically bunched tightly together  which plenty of drivers have warned is actually a more dangerous scenario than higher speeds.  That same year, at the Indianapolis 500, a fan was killed when struck by a tire that came off Tony Bettenhausen's car. The tire bounced off the front of Roberto Guerrero's car and flew to the top row of the grandstand.  In 1998, three fans were killed and six others were injured in CART's IndyCar race at Michigan International Speedway when Adrian Fernandez crashed, sending a tire and other parts into the stands.  The following year, three fans were killed at Charlotte Motor Speedway during an Indy Racing League event when debris from an accident flew into the stands. The track never held another IndyCar race.  In 2009, Talladega was the scene of another scary crash during a NASCAR Sprint Cup race. Carl Edwards' car sailed upside-down into the front-stretch fence on a furious dash to the finish line, showering the stands with debris. Seven fans sustained minor injuries.  In 2010 at a National Hot Rod Association event in Chandler, Ariz., a woman was killed by a tire that flew off Antron Brown's crashing dragster at Firebird International Raceway. The wheel bounced a couple of times and soared over the grandstands  missing the bulk of the spectators  before it hit the woman.  Also in 2010, at an off-road racing event in the Southern California desert, a truck flew off a jump and landed on a group of spectators, sending bodies flying. Eight were killed, 10 injured. There also have been deaths at the Baja 1000 and Dakar Rally, the two most famous off-road races, though multiple-death crashes into the crowd like the one in the Mojave Desert are rare.  Last year, in a rally car race in Ireland, a car went out of control on a rural road and crashed into a crowd of about 30 spectators, killing two people and seriously injuring seven. Witnesses said the car crashed through a fence and into the onlookers before coming to rest on its side beside a home. Lenny Brown, who witnessed the crash from his 38th-row seat in the Petty grandstand, said he would be back in the same section for the season-opening Sprint Cup event. He has no qualms about his safety, sitting so high up, but he would think twice about the seats he had for the race two years ago. But someone surely will  mindful of the risks but eager to be among more than 100,000 fans cheering on stock car racing's biggest stars.